One of the greatest struggles we each face is the search for significance. Our 21st-century sense of identity is grounded in individualism, self-entitlement, and narcissism. From whom we marry to what career choice we make to what church we attend to what we think of church music, every choice is geared around what these things do for us. This attitude of consumerism is one of the most prevalent idols in Western culture and has become an epidemic even in the church. “My Worth Is Not in What I Own” [lyrics] is a song that speaks to the subject of worth by reminding us that true significance is found in our identity in Christ. Kristyn and I recently wrote it with our good friend, Graham Kendrick, in an attempt to reclaim two glorious truths. The first is that we, as men and women created in the image and likeness of the Creator, are created with intrinsic worth. 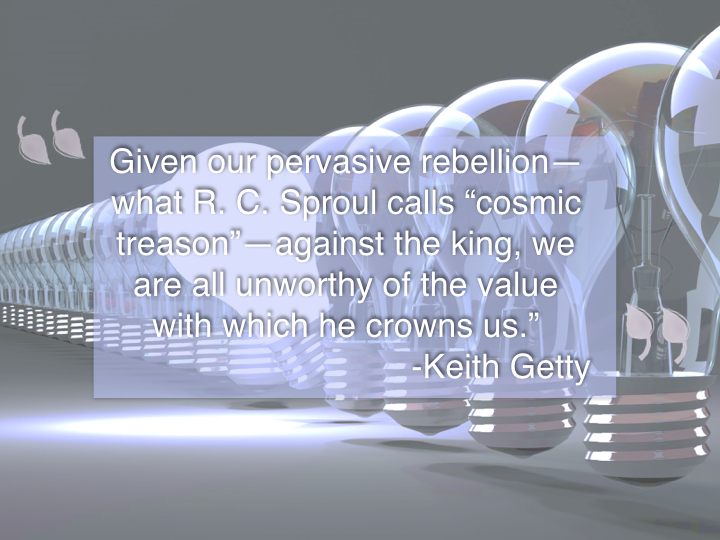 But there’s another truth we want to convey: given our pervasive rebellion—what R. C. Sproul calls “cosmic treason”—against the king, we are all unworthy of the value with which he crowns us. 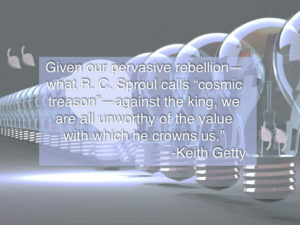 Yet God sent his Son so our worth might be found in something far grander than ourselves. In Christ, no longer do we look to our own accomplishments and achievements to find significance. We look instead to his perfect work on our behalf, and there our souls find the true sense of identity we so crave. The chorus of our song draws from the rich imagery of 1 Peter, which depicts Jesus as an inheritance and treasure far greater than anything this world has to offer. The melody is crafted with a simple and singable Irish-American folk melody, reminiscent of early American hymnody. These melodies tend to be shorter with an easy chorus so that they can be easily sung in a group. 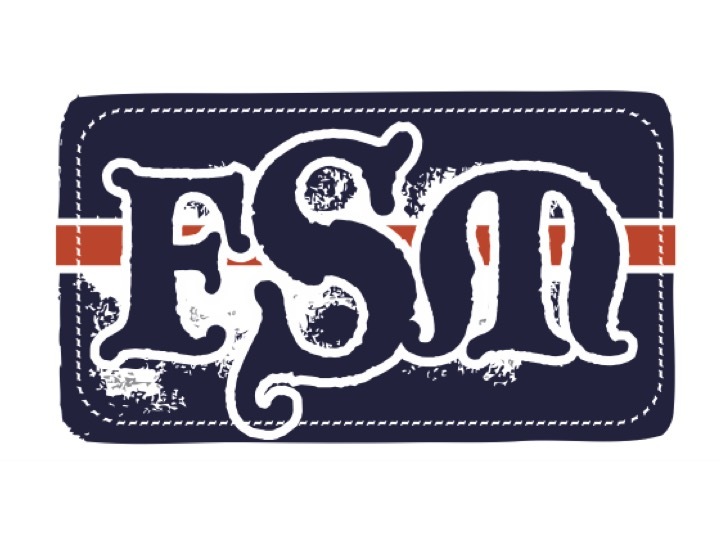 Because of the simplicity of the melody, “My Worth Is Not in What I Own” works well with either just an acoustic guitar or a piano and full band. Because this hymn covers a diversity of themes—stewardship, accomplishment, youth and beauty, idolatry, worth, and the atoning work of Christ on our behalf—it can be used for almost any corporate worship setting. We find it particularly appropriate for the Lord’s Supper or a time of response, though it also helps to prepare worshipers for the hearing of God’s Word since it aims to strip us any notion of clinging to an identity of self-preservation. Indeed, it reaffirms that as redeemed men and women our identity is wrapped up in Christ, the sinless Son of God. Editors’ note: You can find the lyrics to “My Worth Is Not in What I Own” here as well as free sheet music and mp3 of the song here. Also, you can purchase the Gettys’ album recorded live at TGC’s National Conference here. Keith and Kristyn Getty are Irish singer/songwriters and recording artists. Keith and Kristyn are among the preeminent modern hymn composers of this generation. Best known for “In Christ Alone” (penned by Keith Getty and Stuart Townend), the world-renowned hymn has been recorded by numerous artists over the past decade—including Owl City, Natalie Grant and Newsboys—and is a classic sung in churches around the globe.